After a long work day, sometimes all we need is a little comfort food. When you’ve been craving a hearty meal all day, it’s pretty hard to stay healthy. 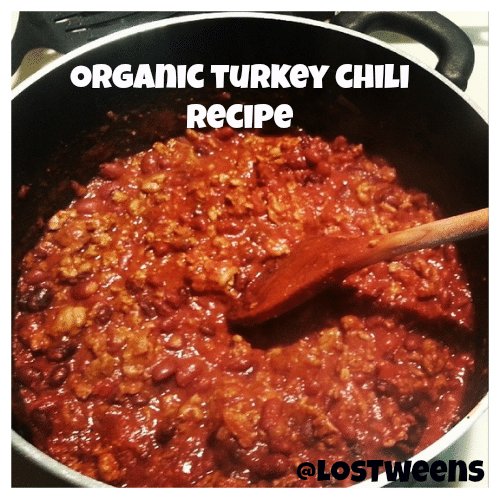 That’s why I developed this guilt-free Hearty Organic Turkey Chili Recipe! Great for parties or rainy days in with the family, you can serve this recipe as a main dish or as a dip. I like to stick to organic ingredients, but feel free to substitute based on what is available in your super market. If you choose to substitute the beans make sure to use an all natural, low sodium option to keep it healthy! To a hot non-stick pot add olive oil. Turn down to medium heat, add garlic, onions, and bell pepper. Add a pinch of salt and pepper and cook until onions are translucent and bell pepper is soft. Slowly add ground turkey breast, season quickly with salt, pepper, cumin, garlic powder, and onion powder. Once the turkey is completely cooked add drained beans and diced tomatoes. Cook for 3 minutes or until beans are hot. Slowly add tomato sauce and add tomato paste to thicken the chili to your liking. Season with oregano and a couple bay leaves. Let simmer for 10 minutes. Remove bay leaves before serving. I love serving this chili over greens and barley but it works great with organic tortilla chips for parties as well! This entry was posted in Ideas, Recipes and tagged chili, Family, guilt-free, healthy, hearty, organic, organic turkey chili recipe, recipe, turkey. Bookmark the permalink.